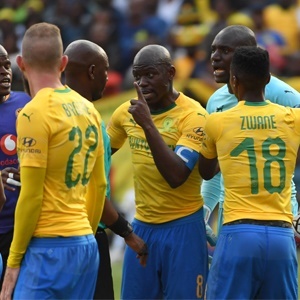 Cape Town - Mamelodi Sundowns coach Pitso Mosimane believes his captain Hlompho Kekana and Orlando Pirates star Thembinkosi Lorch are front-runners for PSL Footballer of the Season. Kekana has never won the prestigious award despite being nominated on four previous occasions. In addition, the battle axe has been a nominee for the PSL Midfielder of the Season for the previous three years, however, once again has never been given the gong. Meanwhile, Lorch has managed 11 goals in all competitions as well as five league assists and is expected to be a major contender for personal accolades come the end of 2018/19. Mosimane said: "I always speak about my players, I love my players so much. Kekana [is] unbelievable, maybe my Footballer of the Year. "I know he failed to win midfielder of the year for five years in a row, five years in a row. Every time there is a midfielder who pops up and beats him, I don't know by one or two votes. "But I'd vote for him for Footballer of the Year. He's 33, it's unbelievable. He is a pleasure to watch, unbelievable. "Obviously we'd like to see Lorch nominated, why not? He's earned his dues, playing Champions League. He is playing in the PSL, in a battle for number one and two. That's it, those are the people."